I love a pretty cami for Summer as it's a step above a simple tank. Don't get me wrong - I absolutely adore wearing tank tops, but sometimes you need something a little dressier. 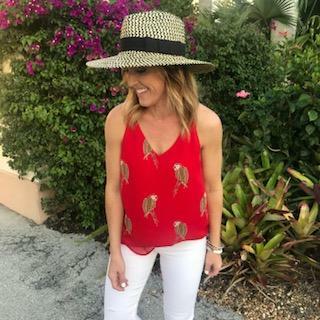 A cami is a perfect, light-weight Summer top! 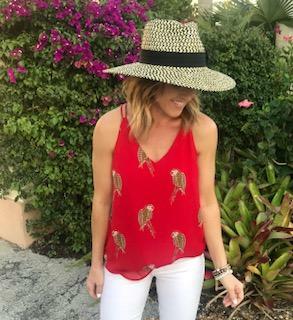 This parrot print cami is just too cute! Vibrant and fun and just right for our Florida vacation! Not headed to Florida? No worries! This print will be so cute wherever your Summer adventures take you. This print is also available in a classic peplum hem dress and a simple tee. I have been wearing this straw hat on repeat. It's available in 4 colors and I actually have 2 I love it so much! It's only $44 and creates such a chic look.